Lavish in the spectacular 3rd floor views of this spacious 2 bedroom, 2 bath unit with NEW King Bedroom in 2nd Suite with pillow-top mattress and luxury linens. Skylights and vaulted ceilings flood the unit with light and provide an oceanfront haven for relaxation while you watch the crashing waves and the pod of local whales. 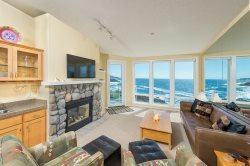 Enjoy stunning oceanfront views and the lovely gas fireplace from the master bedroom and the "great room" living room, kitchen, and dining room. In addition take advantage of den with computer, and of course wireless internet. Vacation here and all the worries of everyday life will fade away as you soak in the jetted spa tub or cozy up to the river-rock gas fireplace. We had a wonderful experience. I would recommend Blue Vacation Rentals. Lisa was great to work with. We would like to Thank her. ;). Surf Song is a wonderful place to stay. It has wonderful views of the sea. It was very quiet, unlike a motel on the beach. If you want a great relaxing vacation I would highly suggest Surf Song. The beds were excellent. Nice and comfy. You can easily walk to Depoe Bay to gift shop and eat. The club house was very clean and we enjoyed the inside pool. If you are looking for beach access this is not for you. The state park north of here has a excellent beach. I think iit is so nice at Surf Song is because you dont have a beach in front of you with people. Great to work with, all charges up front and they represent high quality properties. Our second time with Blue Pacific and intend to come back the next time we want to stay in this area. Beautiful property with a superb view. Most well equipped rental property that I've ever stayed in. Loved the view the most and the angle of this condo gives one a great view of incoming waves. Spectacular views, quality stocked units, very friendly staff. Impressive. Original unit booked had an unexpected hot water issue so we were moved to a larger unit. The staff could not have been more accommodating. The unit was fabulous. Fun whale watching off your very own balcony! Wonderful stay in our unit. Brought elderly parents and they loved the views, comfort, access to the pool and hot tub. Very comfortable and private for two couples. Updated, clean and bright. Full kitchen with all of the small appliances, dishes, pots and pans you could want in a vacation home. Bedrooms and baths were excellent. The view of the ocean was wonderful. No need to purchase a whale watching trip. The whales swim by several times a day and very close to the shoreline. This property is spectacular, comfortable and well maintained. Team was prompt on returning e-mail, polite, professional. Truly enjoyed stay. Will certainly return in future. We have stayed in the North Point condominiums several times over the years and have always been happy with the units we have rented from you. We always enjoy our stays at the North Point condominiums. We have stayed in several units at North Point and I like the view from the third floor units. Surf Song also seemed to be especially well organized and equipped. Always available and quick to respond. Great view, clean, and updated unit.